Whey protein is one of my primary protein sources in my diet – I have it in the morning and as a pre-workout most days. I like to have loads of different flavours and brands of protein powders in the cupboard at home – then at least I don’t get bored! BioTechUSA – who are they? BioTech have been around for nearly 20 years so they definitely know about supplements. They also sponsor some top athletes in the bodybuilding world so I am confident that they can be trusted to deliver a good product. What’s special about the ISO Whey Zero? This ISO Whey is actually lactose free, which is really good for anybody with a lactose intolerance. Personally I don’t suffer from this, though I do occasionally suffer from bloating. The macros and the additives are the main reason I wanted to try out the ISO Whey (93 kcals, 21g of protein and 4.5g of BCAAs). Last time I chose the Chocolate Toffee flavour so this time I thought I’d give the Hazelnut a go. I love all types of nuts so I’m all for trying nut flavoured whey proteins. The texture is the same as the previous tub, it’s a fine powder – there are no lumps or gritty bits, which is a good start. The whey smells kind of hazelnut-ty but also has a distinct chocolate smell too, which I wasn’t really expecting to be honest. 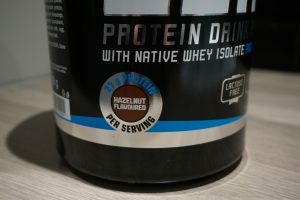 I decided to have this protein powder straight up as a shake – normally I try them in oats – but I wanted to get a true taste test for this one. Taste verdict: it’s really smooth, it tastes really nice. It’s got a good hazelnut flavour but with a hint of chocolate too. Kind of like nutella, but not quite. To be honest if you don’t like chocolate you’re not going to like this flavour, but if you do I’m pretty sure you’ll be on to a winner. You can pick these up in Amazon on prime in 908g tubs or if you just want to try the flavours you can grab the 500g sachets which are a bit cheaper.